After customizing alert messages for a distribution list, you may decide later that an alert is no longer necessary. You can permanently delete an alert; or if you think it might be useful again sometime in the future, you can temporarily suspend it instead. Select an alert from the left panel. Click Delete or Suspend from the command row. If you selected Suspend, the alert is grayed out in the panel with "Suspended" in the Status column. Later, you can select the alert again and click Resume. If you selected Delete, click Yes in the prompt. 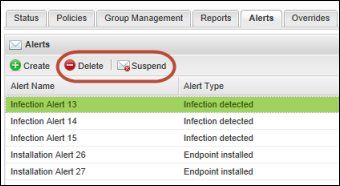 The alert is permanently removed from Endpoint Protection.